It is ironic that the dollar has strengthened rather than weakened over the last year. The response in Washington has included further acceleration in the already-rising national debt plus an expansion of the US money supply and reduction in policy interest rates that, though appropriate, are unprecedented. Under normal conditions, any country on the receiving end of three such bullet-points would see its currency go down in flames. Yet the dollar has appreciated. The explanation is not a mystery. The world’s investors have in two years gone from inordinately low perceptions of (and aversion to) risk and illiquidity, to inordinately higher perceptions of (and aversion to) risk and illiquidity. Virtually all assets other than US Treasury bills look risky and illiquid. That there has been a flight to quality is not surprising. What is perhaps surprising is that US Treasury bills continue to be perceived as the safest of safe havens and the US dollar continues to be the preferred international currency. The flight to the dollar shows up in both the strength of the dollar and the low level of US interest rates. For those of us who warned that the unsustainable current account deficit could eventually lead to a decline in the international role of the dollar at the hands of the euro... that day is not today. The most noteworthy flows into the dollar and into US treasury securities come in the form of purchases by foreign central banks. The People’s Bank of China recently reached $ 2 trillion in international reserves, which it continues to hold predominantly in dollars. Other central banks among Asian exporters of manufactures and Gulf exporters of oil have been behaving similarly. Even the American public is increasingly being made aware that the United States has grown dependent on the Chinese authorities for its funding. There is another irony, however. Even while the US has grown increasingly dependent on purchases of dollars by the People’s Bank of China, US politicians maintain their demands that the People’s Bank of China abandon its purchases of dollars. They don’t usually phrase it this way, because the logical contradiction would be too glaring. 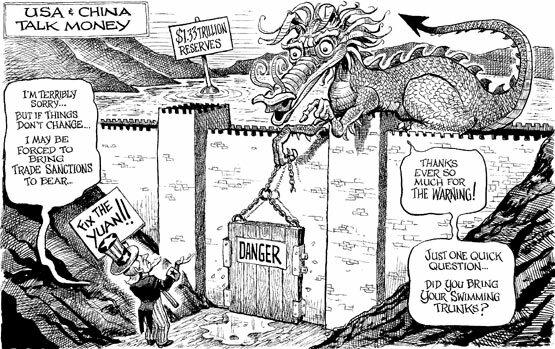 Instead the US policy has been, and apparently still is, that China should allow its currency to appreciate. But it is elementary economics that PBoC purchases of dollars over the last six years are the force that has prevented the Renminbi from appreciating. The American insistence that the RMB appreciate is an insistence that the PBoC should stop buying dollars. The authorities in Beijing have in various ways taken some steps in the direction that Americans have demanded. I have written in the past on the details of what exchange rate policy the Chinese have actually followed over the last four years, and I plan to update that analysis in a successor post tomorrow. that it is unwise to use language such as "unfair manipulation" or "violation of international rules." in the interest of the world, to help address the global imbalances problem. The balance of arguments has now shifted. Overheating is no longer the problem for the Chinese economy that it was as recently as a year ago, having been pushed aside by an abrupt fall in exports. Global imbalances are no longer the most important problem for the world macroeconomy, having been supplanted by the inadequacy of demand. If American politicians are still inclined to make demands on China, it should be for increased fiscal stimulus. Given that China often reacts adversely to foreign pressure, however, perhaps it is just as well that American politicians have been asking for the wrong thing. For Academic Citation: Frankel, Jeffrey.“America to China - “Stop Buying Our Dollars! And Another Thing: Please Buy Our Dollars.”.” Views on the Economy and the World, March 9, 2009, https://nuclearsecuritymatters.belfercenter.org/publication/america-china-stop-buying-our-dollars-and-another-thing-please-buy-our-dollars.